It's another Sunday morning at Central Presbyterian Church in San Francisco where Pastor Wang is about to start leading his weekly sermon. Nothing too out of the ordinary until you notice some of his congregation whipping out their iPhones rather than a bible to follow the reading. With the notion that there's an app for nearly everything these days, it should come as no surprise that an increasing number of people are opting for a 'smartphone connection' to God. After initial confusion as to whether his congregation were texting instead of praying, Pastor Wang is now more than used to the sight of iPhones during worship. Typing 'Bible' into the iTunes store brings up over a hundred apps ranging in price and purpose, from scripture texts, bible quizzes and lingual translations. The Vatican has even given its seal of approval with its official application called iBreviary. The apps are not just restricted to scripture based references. For £0.59 Jewish followers can avoid confusion over which blessings to say before and after eating. 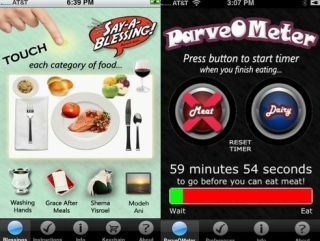 Users pick the type of kosher food being consumed and with a press of a button and the iBlessing app will recite the appropriate blessing in Hebrew first then English. It is the increasing sophistication of these apps which are getting analysts excited. iPhone Islam is an organization that has developed Al Mus'haf, the first Arabic iPhone app which simulates reading the Qur'an. If you need call to prayer reminders or want to know which direction to face when praying there are apps at your fingertips for that, too. While the iPhone-friendly approach to faith may be seen to make religion more accessible, experts argue that adaptation to differing cultural attitudes is vital. "In the US Christians may be used to a more informal style of worship whereas in Korea, followers would expect a more serious and sombre tone. This needs to be reflected in the apps," says Alan Hshieh, Human Computer Interaction consultant at Harvard University. Some apps have even managed to court controversy in cases. 'Me So Holy' was banned from the iTunes store for being "objectionable". The app allowed you to scale and crop your face to replace an image of Jesus. Apple also recently removed all content related to Dalai Lama, the spiritual leader of Buddhist Tibet, from the Chinese app store. Cases like these highlight how sensitive the area of technology and religion remains but some in the religious field are positive about the future. The developers at LifeChurch.tv, a multimedia worship service, are already getting excited at the prospect of apps for the soon to be launched Apple iPad. As for Pastor Wang, the only concern for now is that he opted for a Blackberry.